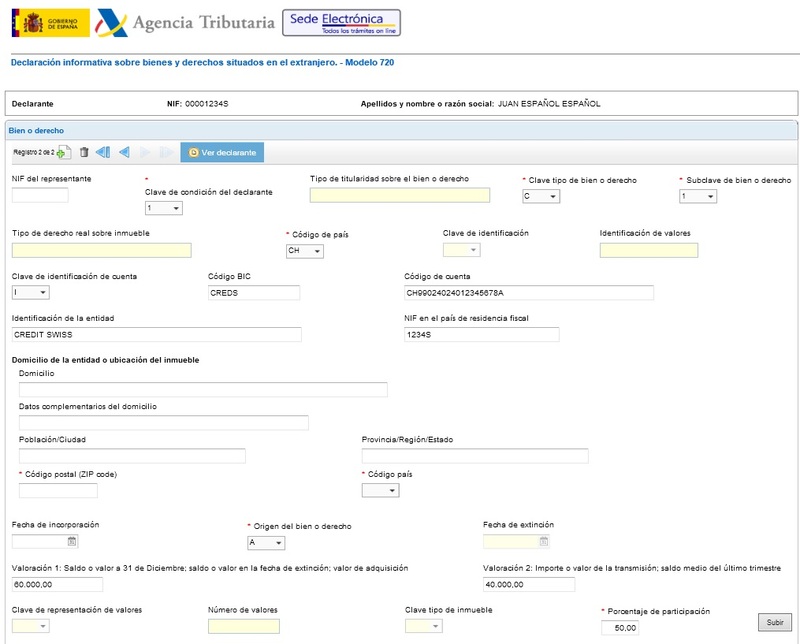 Tax regulations and links to understand how to fill new Spanish tax form-720. Form 720: Declaration of Assets Abroad. This form must be filled by all spanish residents owning assets abroad over 50.000 euros. This obligation must be fulfilled during first quarter of each year. Although this first year it is possible to fill until April 30th 2013.
all types of Real Estate and rights over Real Estate abroad. It is excluded from this obligation to declare when the value thereof does not exceed 50,000 € for each type of assets. The presentation in successive years, after presenting form 720 for the first time will be mandatory when the value declared increases by more than 20.000 €. ‘C’:Accounts opened in banking or credit entities located abroad. ·”V”: Securities or rights located overseas representative of participation in any type of legal entity, values located overseas representative of the transfer of capital to third parties or provided for its management or administration to any legal instrument, including trusts and “trusts” or mass though lacking legal personality, capable of acting in the course of trade. Values or rights of participation in any type of legal entity. As shares and participations in companies. · ‘I’: shares and participations in share capital or equity fund of collective investment institutions located abroad. In this case there is no subtype. · “S”: life insurance (savings not risk) or disability and pension time or annuities, whose insurance companies are located overseas. Insurance life or disability, whose insurance company is located abroad. Temporary or life income generated as a result of the deposit of capital, abroad. · “B”: ownership and real rights over properties located abroad. Actual use or enjoyment and bare ownership rights over real estate. Timeshares, timeshares shifts, part-time property or similar formulas on real estate. Other rights in rem over real estate. In this case you must describe it. It must file a return if any of those paragraphs (1:C, 2:V, I, S, or 3: B) exceds the figure of 50,000 euros, and only those sections in which the figure is over 50,000 euros. In the case of Real Estate shall include the date and the value of acquisition, and the date of opening or cancellation of right over Real Estate and, in the case of values, rights, insurance and income deposited or managed abroad, the balance at 31 December of each year. And where appropriate the amount of transfer or sale. The breach of this obligation has consequences on income tax and corporation tax. Assets not declared, that cannot be proved its ownership arousing from declared income or assets, will be considered income to be taxed, and a 150% punishment over the value of them. Penalty for not filling, filling incomplete, filing with non accurate data, will be punished with 100 euros per data with a minimum of 10.000 euros. On the other hand, Royal Decree approved today partially to Spanish law transposes the Community directive on administrative cooperation in the field of taxation. Thus, reinforcing cooperation in the exchange of information between countries needed for the liquidation of taxes. And already a few years ago the tax agency began to provide tax information for citizens of the EU to their respective countries through the model 299 which is filled by Spanish financial institutions, collected and processed by Tax Authority, and information send to respective countries. Important note: the obligation to submit a declaration in the case of co-ownership of a good, relies on the value of the asset, not in the value of the percentage owned. 1.-Must be filed a Form 720 when ownership of a bank account abroad is shared and whose balance at 31 December exceed the €50.000, but whose ownership corresponds to several people? There is a reporting obligation on the bank account when this limit is exceeded (if none of the other exceptions to the obligation to declare apply) regardless of the number of the account holders. Must be informed total balances, indicating the percentage of participation. 2.-Must be filed a Form 720 when sharing ownership of Real Estate located abroad whose acquisition value exceeds the €50,000, at 31 December but whose ownership corresponds to several people? Yes, there is a reporting obligation on the property when this limit is exceeded (if none of the other exceptions to the obligation to declare apply) regardless of the number of owners. Must be informed total acquisition value, indicating the percentage of participation. 3.-If a person ceases to be authorized in an account of a financial institution located abroad on June 2012 must file form 720? in that case, which has to be balance and the date to be reported? There is obligation to declare if the balance that existed in the account on the date of the revocation of the authorization, if happened by the end of year would had determined obligation to declare by 31 December. Business name or full name of the Bank or credit as well as his home. The complete identification of the account. The date of the revocation of the authorization. The account balance at the date in which I leave be authorized. 4. Do I need to declare pension schemes contracted abroad? There is no obligation of information about pensions plans (for contributions to them or capital into them) as long as is not fulfilled the requirement that is covered by the scheme and capital is withdrawn. 5-When an individual moved abroad once started the exercise and must file the tax on the income of natural persons by this exercise. Are you required to file also the information model with respect to the property and rights abroad? 6.- If a person is the “owner” of an account abroad whose balance at 31/12 is € 40,000 and is also “authorized” in other current account whose balance at 31/12 is €30,000, there is obligation to declare? Yes, provided that no if no cause of exoneration. 7. Form Field “Tax Number in the country of fiscal residence”. There are no instructions what should be put in this box? It will indicate the tax identification number of the entities declared in the previous field, assigned in the country or territory of residence tax. This field will be blank when the “type of asset” take the value “B”. Example: in the case of an account in the Bank Espirito Santo of Portugal, will be the VAT Number of this entity in Portugal. 8. Do I need to declare asset which have been sold during the financial year, and before 31 December has been reinvested in other assets? No. When the loss of the status of owner or real owner referred to in the last paragraph of article 42 ter.1 have his origin in the transmission of values and rights, and the amount obtained had been entirely used in the acquisition of other securities or rights which must be declared, You only must declare balances at 31 December. 9. What exchange rate is used to value goods in foreign currency? In the case of cancellations of accounts, the official rate on the date of cancellation will be used. In the case of real estate, the value of acquisition, as well as in the rest of goods and rights subject to Declaration, must conform to the exchange rate prevailing on the date of December 31 for the year corresponding to the declared information. Esta entrada fue publicada en English, IRPF, Sociedades. Guarda el enlace permanente. We own a property in London I bought it in 2005 for GBP 295,000 (304,837 including taxes). It is not freehold we own a lease until 2112 (103 years). We can convert to freehold by paying about GBP 20k now, this price increases with time. If the freehold owner (us for now) doesn’t pay it the house reverts back to the freehold owner in 2112. Do we have different acquisition dates and valuations? What % do we each own? It is a leasehold property, we do not own the freehold. Do we value it using the usufruct tables based on our age? Or in other words what would you fill in for each of us in the modelo 720? Yes you have different acquisition prices. Each one valuation price of 100% of the real estate when registered as owner. In this case I will register it in 720 for as 50% and 50%. In 720 form you report 100% of asset value. Hi, we have some rental properties in Spain where we are currently residing. We are thinking about moving outside of Europe in the future. If we do go abroad, I understand that we would have to file a non-resident tax form on our earnings from the properties. My question is, the declaration of income would be net, right? I mean income minus expenses, correct? How do I calculate the average balance for a bank account to report in the modelo 720? Some of my bank accounts are open for many many years…what do I input for the opening date of the account when I have no idea what the date is? Average balance is not mandatory if your bank does not calculation of it. But oppening date of account is an IMPORTANT data. You must find it, bank for sure has, as all banking contracts are stored and dated. I have been resident in the UK for several years 2010 to 2017, but I´m resident in Spain from 2018. As I have more than 50k in cash and stocks I have to do the 720. 1) How should I declare the cash parked in my broker (Interactive Brokers), as I don’t have an IBAN for that cash. And it’s also in 5 different currencies. 2) How should I declare the cash I have in Premium Bonds and Income Bonds with the UK National Savings and Investments service? https://nsandi.com I talked to them and they can´t provide an IBAN for those accounts. Hope you can help me, I’m sure many spaniards and british living in Spain should have the same issues. Stocks and liquidity are declared with different codes. Hi there! I have a question about reinvesting the gains from a sale of a primary residence in Spain. We are currently living in our primary residence in Spain where we are currently also fiscal residents. We would like to sell our home and reinvest the gains on a new primary residence in the US. I know that when we sell in Spain we are allowed two years to reinvest the gains in another primary residence in Spain or Europe. But in our case we would be moving to the US for work and that is where we would like to reinvest. Is this possible or will we have to pay capital gains on the sale because the reinvestment will be done in the US? Yes, it is possible to reinvest in a primary residency, in another country. From the date of selling at the notary you have until the same date two years after, to reinvest. You will need to get a public or official document for proving that you did in time. Try to do it faster, so you keep your spanish tax residency. So it makes no difference that the country is outside the EU? Finally, what are the tax implications if I don’t reinvest quickly as you suggest. In other words, when I am no longer a tax resident of Spain. I am asking because I would likely like to wait a year before reinvesting, and by then I would no longer be a Spanish tax resident. Why does the timing matter if the reinvestment is done within the 2 year period? Exempion for reinvesting in first residency is in Inconme Tax Law for residents. This expemtion is granted in tax year that you sell your residency. Even if you dont fulfil yet reinvesting, but you plan to do it before this two years time. Does not matter if you move after selling abroad, and you reinvest abroad in a new first residency, as long as new residency is at least same price as the price of selling old one, and as long as you buy a new residency within this two year time. IF this sell happens 22nd Dec 2018, on your tax return for 2018 you need to state capital gain, and apply for exempion in this capital gain claiming you plan to reinvest. It is ok if you reinvest in a different country or even as non resident, as long as you do before 22 Dec 2020. If you do it after this date, you will need to amend your tax return for 2018 and pay tax for this invalid reinvesting exemption. La última vez cuando hemos tenido que hacer el Modelo 720 ha sido para el año 2014. Desde entonces nuestros fondos en el extranjero han reducido. Por eso hemos consolidado el restante del dinero en solo dos de las cuentas originales y hemos cerrado las otras tres durante 2017. ¿A pesar del hecho que ahora tenemos menos dinero tenemos que declarar el Modelo 720 para 2017? Como entiendo lo que he leido parece que si pero no entiendo el porque. Tendrá que declarar el cierre de las cuentas que ya ha declarado en años anteriores. Last year my wife and I reorganised our banking out of Spain, closing four accounts and opening one new one. We did not not exceed the 20k increase in our assets. What do we need to declare this year? Thanks. Closings must always be declared in case what has been closed had been previously declared. I am facing the need to file my first ever Modelo 720 for 2018. I am intending to close unnecessary accounts and cash in some unwanted fondos de inversion outside of Spain before the end of the year. Even after this i will still be over 50,000€ in both categories and so need to report. My question is whether i need to report the closure of accounts in 2018 for which there was never a requirement to declare before 2018. You will just report what you still having by 31 December 2018.